This is my version of the recipe which can also be served as a starter. Use baby eggplants for this one to get the desired results. It's also a perfect breakfast serving with loads of iron content. Use a generous quantity of cheese to make these eggplants, irresistible. A similar recipe can be made with potato skins too. One can also serve these eggplants dipped in a creamy gravy base. My version doesn't involve shallow frying of eggplants so it's a bit less oily. If baby eggplants are not available, use 1/2" thick square slices of the bigger cousins. Do not remove the tender crown stems of these baby eggplants. Let's not wait further and make these scrumptious, cheesy, and irresistible baked eggplants in a few easy steps. Savor these delicious and baked baby eggplants stuffed with a generous quantity of spaghetti sauce and further enhanced with a topping of lip-smacking cheese. As I mentioned in the beginning, this recipe is quite different from the classic version. So, let's get started. First of all, cut each eggplant in halves and scoop out some flesh from the center to make nice little boats. Heat 2 tsp of olive oil in a nonstick flat pan on a medium flame. Add minced garlic to the pan and stir fry for half a minute. Add scooped out eggplant flesh to the pan and season with smoked paprika and salt. Toss and stir fry for about 2 minutes. Finally, add chopped basil and spaghetti sauce to the pan. Gently stir for about 2 to 3 minutes and thereafter switch off the flame. Keep aside and let it cool down. 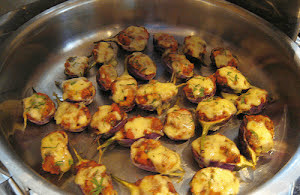 Sprinkle the remaining 2 tsp of olive oil on the baby eggplant boats. Gently rub the oil both inside and out with your hands. Sprinkle both ground pepper and salt inside the fleshy part of the eggplant boats and keep aside for 5 minutes. Take a spoonful of sauce-based stuffing and fill all the eggplant boats with it. Carefully transfer all the stuffed eggplant boats to the baking tray. Finally, sprinkle enough grated cheese on top of each eggplant boat. Transfer back to the serving bowl or plate and serve immediately.